We've come up with a different idea for one of our afternoon diversion projects, though it apparently cannot be done in a day. If you're interested, it's a must to be a committed Democrat or a liberal-leaning Independent. While looking around the Internet, Ray stumbled across the image below from Type and Press. If you go to the link, it is one of the small photos under the 4th of the larger pictures on the page. 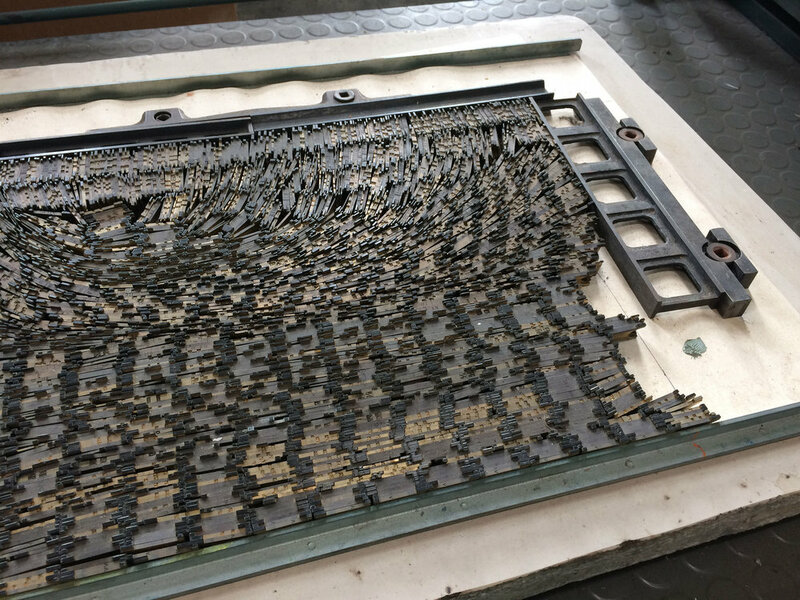 The photo shows Linotype or Intertype mats—we have an Intertype line caster, so we're immediately looking for a way to springboard off this visual. We love the feeling of the wave in the upper portion of the image which is where we got the idea for this broadside. We like trying to find ways to connect and collaborate with other letterpress printers and thought this might offer an attractive opportunity. We are Democrats, and we thought the possibility of an upcoming "Blue Wave" would make a good broadside project that we could collaborate with maybe as many as 10 or 12 people. We don't have much of an idea of how this will work, so this is a fluid project at the moment. Using our Intertype, Ray cast a bunch of slugs, shown at the top of this post, of the words "BLUE WAVE" in 14 point Vogue. The idea now is to try bending about 15 of the lines, so they have the same curve and then cut between the words on the others. Then you can position them however you like so that your area essentially bumps up against the surrounding areas done by other contributors. We'll continue this process until we get the 14.5" x 22.5" broadside filled. There should probably be some headline or maybe the date for the election midterms (at the top or the bottom) to give the piece a context. We also want to include the names of any contributors who wish their effort credited.